The White House is pitching an overhaul of the tax code. Republican leaders highlight company rate cuts while rank-and-file lawmakers are prioritizing middle-class relief. Congress is also toiling over how to pay for the revamp. Corporations may have to temper their wish lists. 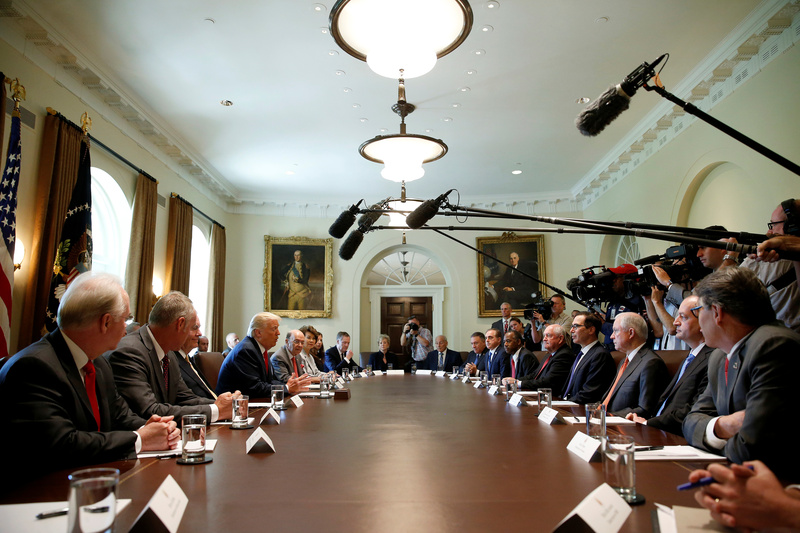 U.S. President Donald Trump speaks during a cabinet meeting at the White House in Washington, U.S., July 31, 2017. U.S. GOP tries version of "extend and pretend"
U.S. President Donald Trump will call for a major tax overhaul at a small-business event on Aug. 1 and will highlight the effort at events throughout the month. On July 27, Trump administration officials and congressional GOP leaders issued a joint statement on their principles for tax reform. They announced that a border adjustment tax would no longer be included in overhaul plans. “The goal is a plan that reduces tax rates as much as possible, allows unprecedented capital expensing, places a priority on permanence, and creates a system that encourages American companies to bring back jobs and profits trapped overseas,” Treasury Secretary Steven Mnuchin and others said in their statement. House and Senate leaders hope to take up tax reform when they return from their August recess. The Business Roundtable, the U.S. Chamber of Commerce and other business organizations are launching major campaigns to lobby for a tax overhaul. On Aug. 4, the Roundtable will kick off a multimillion-dollar national ad campaign. In an open letter to members of Congress and congressional candidates, Chamber CEO Tom Donohue said on July 20 that “failure is not an option” on tax reform.